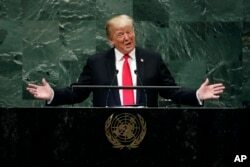 U.S. President Donald Trump spoke at the 73rd meeting of the United Nations General Assembly, praising national sovereignty and warning Iran and Venezuela. In his speech on Tuesday, Trump urged representatives of member nations to have pride in their own nations and to seek prosperity together. The U.S. president did not single out one nation with severe language as he did with North Korea during last year’s speech. However, Trump did criticize Iran strongly, calling its leaders corrupt. He added that the nation does “not respect [its] neighbors or borders” and continues to support terrorism. Trump also criticized the nuclear agreement with Iran, from which the U.S. withdrew in May. He said the U.S. would increase pressure on Iran and urged nations to cut oil imports from it. The president also announced a new campaign of economic pressure on Iran. Additional restrictions will go into effect on November 5. Trump noted that since sanctions had been lifted, Iran had increased its military budget by nearly 40 percent. The U.S. president also called for restoring democracy in Venezuela. He said Venezuela had once been the richest country in South America, but the socialist policies of President Nicolas Maduro had made it extremely poor. He announced additional sanctions that would target Venezuelan officials and close allies of Maduro. Trump praised his administration’s efforts to meet and negotiate with North Korea’s leaders. Trump met with North Korean leader Kim Jong Un in Singapore on June 12 to discuss efforts to end North Korea’s banned nuclear weapons program. US President Donald Trump (R) looks on as South Korean President Moon Jae-in speaks during a bilateral meeting in New York on September 24, 2018, a day before the start of the General Debate of the 73rd session of the General Assembly. / AFP PHOTO. Trump thanked Kim for the steps he has taken. However, Trump noted that much work remains to be done. United Nations Security Council sanctions remain in place. North Korea announced plans to take apart a nuclear testing center and a missile launch site last week. 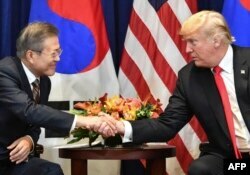 In addition to Kim, Trump thanked leaders in Northeast Asia who have been involved in negotiations with North Korea. He gave special thanks to South Korean President Moon Jae-in, and also to Japanese Prime Minister Shinzo Abe and Chinese President Xi Jingping. Trump called his administration’s foreign policy one of principled realism. He called for agreements reached years ago with trade partners to be renegotiated so they are, in his words, fair to the United States. Trump announced that newly placed U.S. tariffs on Chinese goods brought the total value of Chinese products facing import taxes to $250 billion dollars. Trump praised Gulf countries in the Middle East, including the United Arab Emirates, Saudi Arabia and Qatar. These countries, the president said, have promised to work toward peace in Yemen, which is suffering a civil war. However, he criticized OPEC, the Organization of Petroleum Exporting Countries, for high oil prices. The United Arab Emirates, Saudi Arabia and Qatar are all members of OPEC. Trump said oil prices must be brought down soon. Trump began his speech to the international body by talking about the “extraordinary progress” made under his administration. He noted that unemployment for African Americans, Hispanic Americans and Asian Americans had reached historic lows, while stock market values have hit record highs. President Donald Trump smiles at reaction from U.N. members during part of his speech..
Trump caused a moment of levity when he praised what his administration had accomplished as almost unmatched. Trump did not apologize for calling on other nations to share more of the costs of U.N. activities and international aid. He said his administration would take a “hard look” at U.S. foreign assistance. He also said the U.S. would no longer pay more than 25 percent of the U.N. peacekeeping budget. The president also stated opposition to the global compact on migration, an international agreement on migration policy, and the International Criminal Court in the Hague. Allies in the G7 group of developed nations and many trading partners have called Trump’s policies protectionist. They have argued that the U.S. is pulling back from its traditional responsibilities to the U.N. and other nations. Mario Ritter adapted this story for VOA Learning English. Kelly Jean Kelly was the editor.